How Did They Get That Snarky Lead Sound? There's a particular lead sound I've heard many times in recordings from various artists but had to get an inside tip to drill. When I first tried it, there was always something missing. The sound has a snarly, nasal quality and was clearly based upon a clean amp setting. Mark Knopffler is known for a variant of it. It shows up on David Gilmour's song, "Where We Start," from his On An Island album, and some of his technique can be seen on his Remember That Night concert video, that can help all the pieces for creation of this sound come together. You can get a preview of that cut and download it from Amazon, HERE. The performance side of the equation involves plucking the strings with your fingers. The equipment side involves some pretty specific gear. Let's get started working it out. First off, the sound is a combination of a specific guitar body type, a pickup type, an amp type, a certain type of processing, and a playing style. Which of each? The sound starts with a semi-hollow guitar. They have certain body resonances that play out the pickups and add to the effect of this sound. They also tend to amplify a certain amount of fret noise that can also add to the funkiness of this sound. 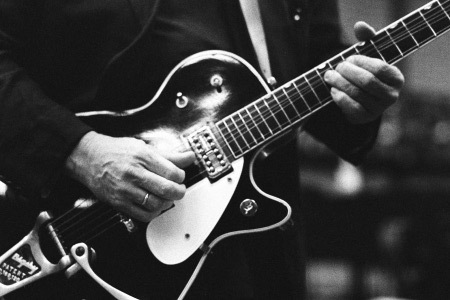 There have been several inexpensive new alternatives offered by Epiphone and Gretsch that can open up that avenue. Don't have a semi-hollow and don't want to pick up an inexpensive one? No problem: Continue to follow the chain because Mark Knopffler got much of this sound live with his solid-body Les Pauls and Strats. Next, the best examples I've heard came from guitars with bright humbuckers. When I saw David doing his sound, he was using his Gretsch Duo Jet with Gretsch Filtertron 'buckers. I've had good results creating this sound on a Gibson ES-335 equipped with Gibson's '57 Classic humbuckers, which are both sweet and bright. Nextly, you'll want a compressor in the chain to knock down some of the dynamic spikes created by the playing technique we'll discover later, and to add sustain. Finally, you'll want to play through an amplifier that has a fairly bright but nice, clean, Fender-y sound. I've been able to make this happen with a 22-watt Fender '65 Deluxe Reverb Reissue. Obviously, if you want to play loudly like this, you'll want some more power. A Fender Super or Twin should do nicely. And now, to the technique: Start with the bridge pickup selected. To get the characteristic sound, you'll need to pluck the strings with your fingers, rather than a pick. You must also learn to pick the strings by plucking away from the body of the guitar, rather than transversely across the face of the guitar as we normally do. As you pick, lift the string gentle away from the face and let it drop. You can do it with a single finger or the thumb, or for more of the snarly effect, pinch the string between two fingers and whip it. Obviously, this will generate more energy than simply picking with a pick. Specifically, it will create a stronger attack. You'll want to learn to control that and use it at your discretion. This is also where the compressor is very useful, moderating the more extreme excursions and producing a sweeter sound. You don't necessarily want to set the compressor's threshold so low that all of the dynamics are squashed: some of the attack dynamics can be used to highlight a particular passage. If you have nails on the right hand, you can also play with varying the ratio of "meat to nails" as you pick to add some variety to the attack. More meat yields a rounder, softer sound. More nails gives you a stronger attack. Whatever, the more you "whip" the string, the snarkier it sounds. You can begin to learn the technique on the bridge pickup, where the snarly, snarky characteristic is really highlighted. You may find yourself rolling out some of the high end frequencies at the guitar to control some of the overtones generated by the fingerstyle attack. Once you've got a handle on the dynamics of the sound, try moving to combined bridge and neck pickups or neck pickup alone. The effect is more subtle and a little sweeter there but is still useful and really very delightful. From there, you can try it out with a pinch of distortion. On "Where We Start", David Gilmour kept the sound very clean but on the live video it looks and sounds like he's playing through an old tweed Fender Bassman, and they were never all that clean at band volumes. And by the way, there are some players who accomplish this technique with a pick, so you can progress into trying that as well. With a pick, it tends to sound more like country "chicken pickin'." Well, there you go! Good luck trying out this interesting technique and practicing it to perfection!